My sisters and I received many gifts from our grandmother over the years. To have discovered this recipe for life she inadvertently left behind for us is especially poignant; it has only been a few months since she passed away. Thank you Gram, for these words of wisdom. Subscribe to my blog now with a simple clickRSS feed. Thanks for visiting! That is a recipe that deserves to be shared for sure! What a great idea and fabulous legacy she left for you girls to find. A true treasure! My sister shared it with me yesterday. It made my day! I am glad you enjoyed this Nic. Vinny C recently posted..Just Where Have You Been This Week? – Having Cake Then Ending Up At The Dentist’s. Thank you Vinny. She was a loving, wise woman. I love this blog post. Gram would have wanted us to find these words and LIVE by them, she lived everyday by them. I agree. Thank you for sharing Kristen. Can you imagine how funny the conversation would be to explain to Gram what a blog is and that I shared it on a blog? Thank you for visiting and sharing your wonderful story. I am glad my piece brought back fond memories for you. Reader interaction is such a wonderful part of blogging so thank you again for commenting. Thanks to both of you; very special! That would have been hilarious! How wise your grandmother! But then again women of that era had a certain feminine sense that seems to be lost nowadays. I liked this very much…I putting it on a note card on my desk. I am happy to hear you enjoyed this and that Gram’s wonderful message will be on your desk. Thanks for sharing your comment. I love this. 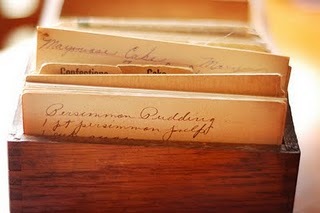 Love the goodies from our grandparents–and old recipe boxes are my favorite! Glad to hear this resonated for you. It was a wonderful discovery from a special lady who is missed. It’s too bad you didn’t have a scan of this beautiful piece of advice left behind. I think it would have been wonderful to see! P.J. recently posted..Night games – a contest! I hope to see it next visit to Louisiana!